I am inspired by many videos in Youtube on organizing items in one’s home. 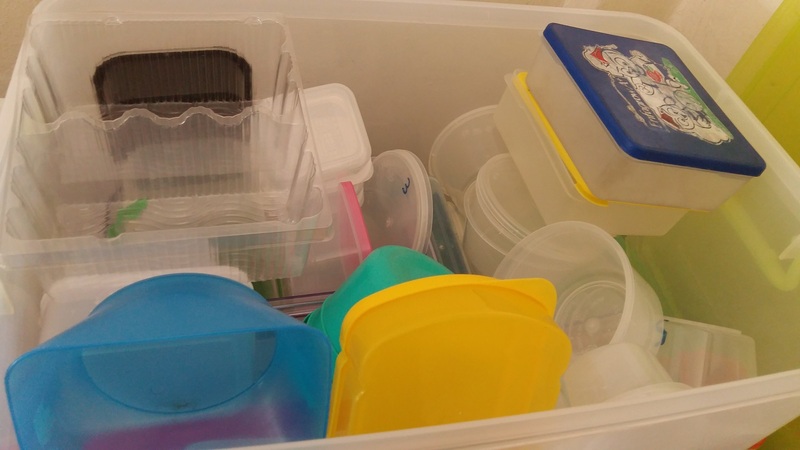 Many would teach to organize plastic containers in kitchen cabinets. However, not many people can openly keep their containers in kitchen cabinets as they may be creepy crawlies like lizard, rats and cockroaches that may find a suitable home. Homes located near food courts, or with neighbors with less than hygienic habits may result in the visit of such unwanted visitors. I have thought for a long time on how to organize food containers. I use a number of plastic containers for keep food items in fridge and packing food from outside. Usually I don’t like to separate the container from their lids because it gets annoying to search for items. I keep the lids together for most containers. By placing these items in a plastic storage box, it prevents the items from falling and spilling all over. Also, by keeping all in a box, I also remind myself not to accumulate too much of plastic by doing my best to ensure that the containers must all be able to fit into the container. I have been using this method for a few months and find it is quite workable. If need to, I can keep the entire plastic container below my kitchen cabinets. This would prevent the creepy crawlies from contaminating my containers. Yes, at times it would get untidy but it can be quickly tidied up. When buying plastic storage bins, I try to get the clear ones. The clear containers are usually more expensive but they are worth the price. So far, I have bought a lot of similar storage bins of the Tesco brand ….the time I bought it they cost about RM24.90 each which is quite reasonable.